Easy and efficient BI testing with Kinesis CI, so that you can always trust your Tableau dashboards. Kinesis is a test framework that adds automated testing and continuous integration capability to your Tableau Server. 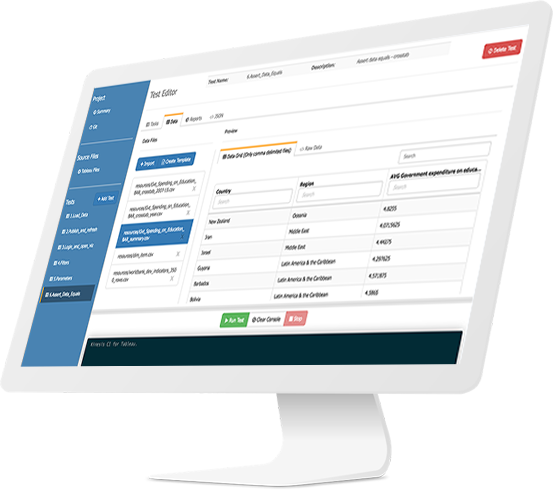 We produce quality automated testing tools for BI developers and analysts to save time and effort and reduce the high costs of repetitive manual testing, by shortening your BI development cycle and increasing reliability of your BI dashboards. 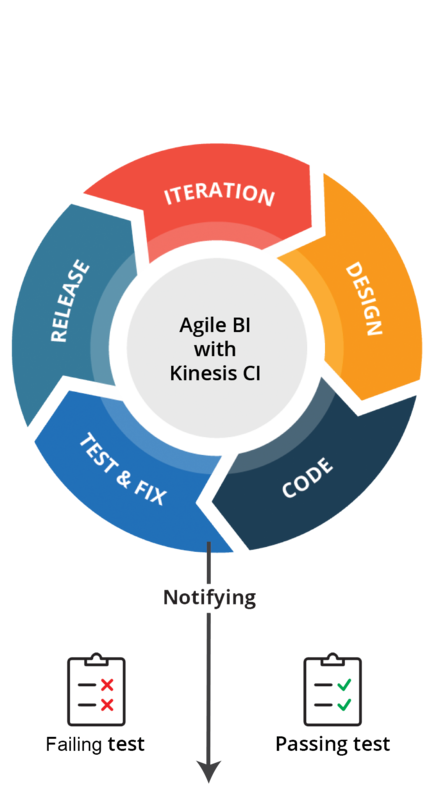 Kinesis CI is a highly modular and flexible tool to cover your BI testing needs from A to Z.
Validate your dashboards on a continuous basis. Test automatically after Tableau or server upgrades. Ensure user requirements are met in terms of functionality and layout at all times. Detect issues immediately and locate them more easily. Test every step in your BI workflow. Validate data against expected results and calculations or directly against your underlying data source. Simulate user journeys and clicks as well as interactions. Integrate your tests with a CI pipeline and run after every change to validate your dashboards. Test your dashboards across environments (i.e. development and production). Ensure dashboards are fully validated before deployed to your prod environment for your business users. Deploy fully tested dashboards automatically with Continuous Delivery. Drive load to your Tableau Server and measure response time against SLA requirements. Determine capacity needs and accelerate long testing efforts for server upgrades and new releases. Ensure SLA requirements are met at all times. Automated testing is key to increase productivity, eliminate regressions and maintain high quality of reports. Our test tool can be integrated with continuous integration services to make testing integral part of your development workflow. In most areas of software development, adopting CI and other agile methodologies have changed the way people test. Development teams are required to do more testing, faster and more often. Testing is done earlier in the development lifecycle and the focus is on automated testing as developers try to move away from manual testing. Testing Data Warehouse/Business Intelligence (DW/BI) applications is different from testing traditional transactional applications as it requires data-centric testing approach and you need to work with third party BI tools. The volume, variety and complexity of the data make it difficult to create robust test cases and specialized skills are required to execute data validation and verification process. Deploy fully tested dashboards automatically to Production with Continuous Delivery. With Kinesis CI you can be on top of your data and ensure user requirements are met at all times. Detect issues immediately and locate them more easily. Integrate newly developed dashboards or features regularly into a shared repository and verify with an automated build to identify potential issues immediately. Integrate your tests with a CI pipeline in minutes and let it run all the testing jobs for you after every new commits or whenever you want to. See how iVantage Health Analytics Leveraged a Partnership with Kinesis CI to Develop Analytical Insights Designed to Optimize Care Delivery to Patients Across the US. How to Test if Your Data is Up To Date on Your Tableau Dashboard? Need help with Kinesis CI? © 2019 Kinesis CI Ltd.
By checking this box, I acknowledge that I have read and accept Kinesis CI’s EULA. Check the box to agree to terms. Thank you for downloading. You can generate your Trial License in Kinesis Designer. Installation Manual and information on downloadable packages. To use Kinesis CI out of the box, plain vanilla Tableau Server installation is supported. For any custom Tableau installation, SSO, custom login or to fit enterprise IT implementations, initial setup may be required, that will be subject to an additional consulting arrangement and require the involvement of your internal Tableau Server admin. Please fill-in the below form. We will be in touch with next steps regarding your order soon.